stAllio! 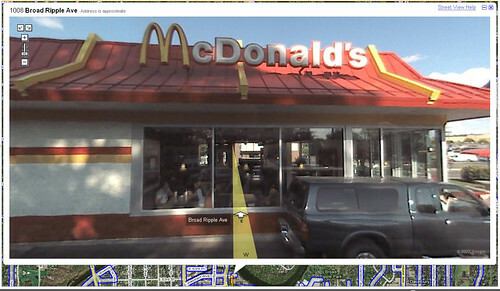 's way: what is it with google street view and mcdonald's? what is it with google street view and mcdonald's? whoever drove the google street view van through indianapolis must've had some serious munchies. they stopped at or drove through the parking lots of at least 6-7 indianapolis mcdonald's locations. here they are at the one in broad ripple. there's no documentation of them stopping at the one in castleton, but they did turn off 82nd street onto the frontage road in front of the mickey d's for no apparent reason. here they are at the one at 96th & meridian. they actually go all through the parking lot, which google refers to as "belle manor ln". you know a restaurant is important when its drive-thru gets a street name. here they are at the one at 38th & meridian. here they are at the one at 52nd & keystone. and here they are at the mcdonald's by 38th & keystone. The Star did another article on Google Street View. yes, and it mentions steph mineart. right in the lede!